While mass-market cruise ships just keep getting bigger, boutique cruise lines maintain their smaller ship size while elevating luxury to new heights by adding new ships, updating existing ones and including more and more services and amenities. For those of you who appreciate cruising in luxury, here are some exciting developments available with three of the leading cruise lines. Touted as the most luxurious cruise ship at sea, the Seven Seas Explorer sets sail in July 2016 and will become the fourth ship in Regent Seven Seas’ fleet. This all-suite, all-balcony ship holds 750 passengers and offers four gourmet restaurants, Gourmet Explorer tours coupled with a culinary arts kitchen for hands-on cooking lessons, and a Canyon Ranch Spa. Exclusive to the Explorer are a variety of suite choices including the new Regent Suite boasting 3875 square feet with two bedrooms, butler service, private car and driver in every port and en-suite spa with unlimited spa services! Who will want to leave their room? All three of their other ships are scheduled for extensive refurbishing during the next 18 months. Regent Seven Seas include most services in their cruise fare – unlimited shore excursions, fine wines and spirits, crew gratuities, airport transfers, WiFi and even airfare in many cases. Crystal Cruises recently added the luxurious 62-passenger Esprit, making a total of three ocean vessels in their fleet. This super yacht was designed for exploration to smaller ports and off-the-beaten path destinations due to its size. Crystal even expanded into river cruising into 2016. Seabourn will soon be adding two new all-suite ships beginning this year, rounding out their fleet to five. Unique to this luxury cruise line is their onboard water sports marina and country club casual environment. Want to learn about all the luxury cruising choices available and need help deciding the best option for you? Jan Acorn can streamline the process for you – call us today for a complimentary 20-minute consultation. Attention all Foodies! Looking for ways to enjoy great cuisine while traveling? Bon Appétit, inspiring food lovers with imaginative culinary delights through magazine recipes for decades, has ventured into the travel arena by partnering with luxury cruise companies, Regent Seven Seas and Oceania Cruises. Cuisine at sea has been elevated to new heights through this innovative partnership. Well-known chefs have been recruited for designated Bon Appétit Tastemaker sailings – not only to lead culinary preparation onboard, but to also offer hands-on cooking classes and host epicurean adventures such as market visits and wine-paired dinners. Oceania Cruises offers Bon Appétit Tastemaker itineraries ranging from 7 to 35 days throughout the globe, with sailing dates in 2016 and 2017. Enjoy special amenities such as a special wine event, complimentary bottle of wine signed by the designated winemaker for the cruise and a Shipboard Credit to use as you please. Regent Seven Seas Cruises offers Bon Appétit Tastemaker experiences onboard a number of their 2016 and 2017 sailings ranging from 7 to 57 days. Their culinary celebrations at sea feature world-class chefs and food-focused itineraries, with special amenities to Bon Appétit Tastemaker guests. If you enjoy cruising and superior cuisine, then we invite you to learn more about this exciting collaboration. Gateway Destinations owner, Jan Acorn, is honored to be designated as one of Bon Appétit’s 50 Tastemakers nationwide due to her enjoyment of food-focused travel and dedication to creating extraordinary vacation experiences for her clients. Three years is much too long for a return visit through the countryside of Provence, France. I anxiously await to again revive all my senses as I immerse myself in this colorful, fragrant, tasty, and sensual corner of heaven with a small group of ladies. Our journey begins October 17 in Avignon, where we will explore this walled city and the former palace of the Pope. This will be our base as we explore the surrounding countryside before traveling further north into Haute-Provence. Our days will be filled with tasting the delicious foods and wines of this region as we visit an outdoor marketplace, indulge in wine tasting and learn cooking secrets from Chef Jean-Jacques Prévôt in his Cavaillon kitchen of La Table des Melloniers, Chef Jean-Jacques Prévôt. 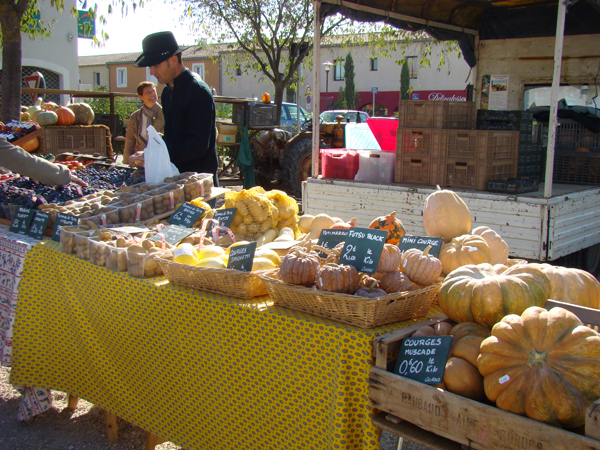 Not only is Provence known for its abundant produce, but also truffles, perfume, soap, olives and olive oil, honey, linens, Santon dolls, wonderful cheeses and a wonderful variety of red, white and rosé wines. We’ll do our best to sample all of these products as we wander through village after village in this hypnotically charming countryside. Along the way, our bi-lingual local guide will share his knowledge of French art, culture, history and architecture of this rich area. October 5 – 12, 2008, Women-only Tour to Tuscany! Jan Acorn, owner of Gateway Destinations, had the pleasure of leading a small group of ladies into the heart of Tuscany, Italy for eight days in October. We began with a guided walking tour of Florence, a delicious welcome dinner at a local trattoria to get to know each other, and spent the next morning exploring on our own before venturing into the countryside for the rest of the week. Our countryside adventure began in the Chianti region during the bustling grape harvest season and included cooking classes, wine tasting, an introduction to olive oil, market visit, tour of Meleto Castle and much more! Our journey continued further south where we shopped and explored Siena and numerous charming villages, picked chestnuts and wild porcini mushrooms, enjoyed lunch in an authentic country kitchen, and picnicked in picturesque Pienza – all while residing at a luxurious thermal spa resort. Read more about some of the highlights of this women’s journey. Two delicious evenings were spent in authentic country kitchens as our guests learned to cook treasured Italian family recipes with the Tuscan Mamas. 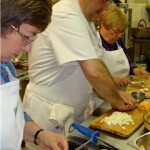 Located in the heart of Tuscany, this cooking school resides in the beautiful forested hills of the Chianti region. From stuffed zucchini flowers, risotto with local fresh mushrooms, to gelato with fresh citrus and limoncello liqueur to name some of the dishes, our dinners were heavenly and fun to prepare. 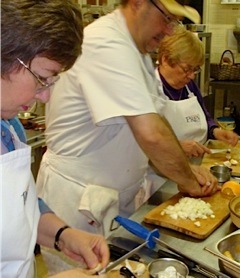 Join us in 2009 as we return for more cooking in this beautiful region of Italy! Our 8-day escorted women’s tour to Italy in October was rounded out by spending several relaxing days at Adler Thermae, a beautiful 5-star natural thermal spa resort in southern Tuscany. Overlooking an expansive valley filled with Cyprus trees, vineyards and olive orchards and located on a picturesque hillside in the tiny village of Bagno Vignoni, this resort has it all. It is blessed with non-odorous thermal water and unbelievable views. The rooms are spacious, well-appointed and all have views of the outdoor pools and valley below. The food and service are great, and the spa includes an array of fitness classes, exercise equipment and a wide variety of spa treatments. There are even bicycles available to tour the countryside. Aah…the simple pleasures of life lived as a local under the Tuscan sun! Our guide introduced our small group of ladies to authentic country life in this region. We started the morning by picking and sorting chestnuts as well as harvesting wild porcini mushrooms (a rare find), then visited the home of his mother in Castledelpiano. We enjoyed homemade polenta made with chestnut flour, our fresh mushrooms and other tasty regional food, while enjoying young wine made by his brother that morning. All in all, a perfect expression of la dolce vita!